New Flavors from Just Pop In! I am super excited to be sharing several new flavors from Just Pop In with you! They’ve asked me to taste test and share my thoughts with you. What, try out popcorn, you say? Enjoy my favorite snack in a variety of flavors, you say? Of course! Just Pop In is a gourmet popcorn company in Indianapolis that really strives to integrate themselves into the community by working with local businesses, festivals, and other food-related partners to create unique flavors with their popcorn. I sampled their Bloody Mary popcorn made with Hoosier Momma, a local company that offers Bloody Mary mix, and then 6 other flavors created exclusively for the Omni Severin Hotel. They recently celebrated 100 years of history in Indianapolis and I was honored to be a VIP at their party. I’ve been a huge fan of the hotel and specifically Severin Bar, the sports lounge within the hotel that serves Indiana draft beer, pre-prohibition style cocktails and bar food sourced from local farmers. Sounds like the perfect combination, right? Now, as I like to say, onto the food. This has heat and great tomato flavor that’s not too overpowering. Popcorn shouldn’t make you feel like your eating a vegetable and this does not. Do I need to repeat myself in that I hate tomatoes? Well, sort of. I love ketchup with all of my heart. I kinda thought this popcorn would taste like V-8 but it doesn’t. I don’t even drink Bloody Mary’s but I like this! Kudos for Just Pop In for getting me to like this popcorn. The rest are the Omni Severin exclusive flavors! If you look closely at the picture below you can see little red specs up against the caramel. That’s the hickory-salted heat that gives off a gentle flavor of BBQ. There’s mild heat but nothing that would keep you from eating the whole bag. Trust me! I’d buy this for a cookout. Now I want to light up the grill. See what this popcorn made me do there? Flavor hypnosis. Who knew about citrus on popcorn? This combination is absolutely delicious. I love the salty/sweet combo, mostly because I’m more of a savory than a sweet person, but occasionally I crave a sweet treat and this is going to be it from now on. Lime and lemon refresh your palate and keep the sugary caramel from being too sweet. This has me wanting to put lemon and lime zest on everything now. If you look closely you can see the white specs of salt. Here you have subtle mustard flavor with a mild amount of heat, less heat than the Bloody Mary if you compared the two. I imagined I was eating a sandwich with mustard, hot peppers and cheese. 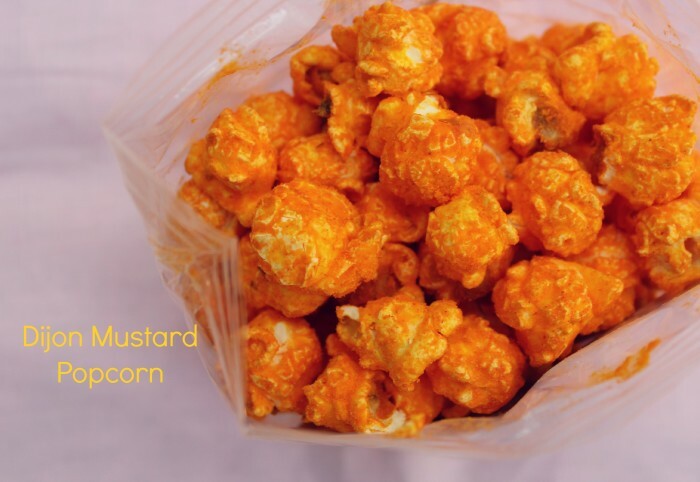 As someone who is on the fence about mustard (even in that I rarely have it on a sandwich), this popcorn impressed me. I’m seeing a trend here – popcorn makes me like things I don’t normally like. Woah! Kapow! This is a kick in your tastebuds! Those little green flecks are packed with flavor, easily the strongest from this group of samples. The Screaming Mini that I tried in their Pick Your Pop Challenge also had pickle flavor but I commented that it was too subtle. You definitely won’t miss the pickle in this. I liked the flavors, but probably wouldn’t eat more than a few at a time. This, however, makes for awesome portion control. Unless your name is Rahul , in which case he ate this bag quite quickly. This two-toned popcorn was the prettiest out of the group of samples. Put both the white and brown ones in your mouth at the same time for a flavor explosion (says Rahul , yet I do agree). The packaging with peaches on the label was also a nice touch that mimics the delicate flavors. I love savory things over sweet, but this popcorn is a nice mix that won’t make you feel like you are indulging in your sweet tooth too much. The peach flavor is also subtle, but I don’t think you’d want any more than what is already offered. Now, how could this not be delicious, I mean, really. A crunchy outer shell of chocolate that has wrapped itself into the crevices of each kernel of corn. They weigh more than the other samples, too! No, you aren’t imagining the pink spots on the outside – it’s the merlot-infused sea salt, which truly is a great combination with the dark chocolate. Almost too pretty to eat. Not. Overall conclusions: Each piece of popcorn has a uniform taste. There’s enough of each ingredient on each bite of popcorn, and every kernel is fully popped. The bags are full to the brim and always fresh. It’s what I’ve come to expect from Just Pop In – good quality ingredients that were made with love. Interested in trying out these flavors for yourself? The Hoosier Momma Bloody Mary popcorn was released in their stores on August 28 and the Omni Severin exclusive flavors can be found inside the hotel. I’m familiar with the hotel, but if you aren’t, you really should get over there to try these new flavors. You’ll be able to sense why they were made for the hotel when you absorb the atmosphere around you. Find out more about Just Pop In by visiting their website, Facebook page or Twitter account! Disclosure: I was provided with samples of these flavors to try so that I could write this review. Photos, taste testing notes and feeling are all my own. Duh. Because I wrote them. And I’m honest. Now go eat.